The National Center for Manufacturing Sciences (NCMS) has announced plans to establish a manufacturing (AM) innovation center in Aberdeen, MD, focused on next-generation additive manufacturing, materials and processes. The center will spearhead scientific breakthroughs in materials, as well as the launch of new factory machinery for the manufacture of parts for aircraft, automobiles, munitions, medical devices and other military-focused products. The goal is to provide U.S. troops with the most updated platforms and tools available. Read more. France's naval defense specialist, Naval Group, and the Centrale Nantes engineering school have successfully 3D printed their first full-scale propeller-blade prototype for military applications using the wire arc AM process. The Naval Group and Centrale Nantes team hopes to accelerate the cross-industry adoption of hybrid manufacturing for making large-scale parts on-demand. Read more. This steering knuckle, developed by Hirschvogel Tech Solutions, was designed with a structural lattice mimicking bionic geometries. Printed with selective laser melting, the resulting component maintained structural integrity while reducing weight 40% compared to the traditionally cast part. Download the case study. As maker of the first 3D-printed titanium part installed on a series-production Airbus commercial aircraft, Arconic is developing materials and techniques to advance the manufacturer continues to lead the way in qualifying even more-complex 3D-printed parts. How did Arconic start down the AM road, where is it now and where does it hope to go. Read more. 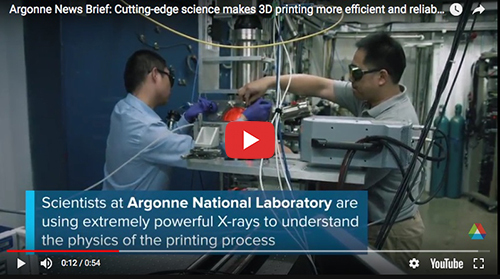 Scientists are using powerful X-rays to understand the physics of the 3D-printing process and to help industry make reliable parts. This event will provide opportunities to learn about the latest technologies and hear case-study presentations. Attendees also will have the opportunity to participate in exclusive plant tours at the GE Additive Customer Experience Center and the Carnegie Mellon NextManufacturing Center, to engage with company representatives and to view a variety of 3D metal-printing machines in action. Learn more about the event and to register. What are some tips for helping to achieve consistent quality in our builds, especially in critical production–part applications? You will find them in this issue's Q&A. From powder conservation to reduced time for support design, development and removal, support-generation software generates savings. ☉ 3D Enables Rethinking of Design Approach...and that's exactly what the coolant-system experts at Grindaix did with the help of Bionic Production and Trumpf.